I've chosen a single C&P from an academic source in the UK - so ignoring material sourced from Germany, Israel, the UUSR or Ukraine, and obviously ignoring any openly partisan source such as vho. "Sonderkommando 4a, included Security Service (Sicherheistdienst), Waffen-SS, and police battalion personnel. Other police battalions and Ukrainian auxiliay police were drafted to assist in the operation. Beginning on September 29, the Jews of Kiev were assembled and marched to the vicinity of the ravine. Not far from its edge they were told to strip off their clothes and remove their valuables. In groups of ten they were marched to to the edge, whereupon they were shot and fell into the Yar. The accepted estimate is that 33,771 Jews were executed in this manner. Babi Yar continued to be an execution spots for many months subsequently. Jews from other parts of the Ukraine were brought their for execution. So to were Roma and Sinti, and Soviet prisoners of war. The Soviet authorities estimated that approximately 100,000 corpses lay strewn across the bed of Babi Yar. Beginning in July 1943 SS personnel were given the task of eliminating all evidence of the massacre. To achieve this the corpses were exhumed and burnt. 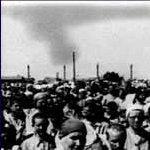 The task of exhumation, moving and burning the corpses, was forced on inmates of the concentration camp Syretsk, 100 of whom were Jewish. Aided by landmoving machinery, the task was completed in six weeks. No trace, apparently, was left. With the exception of fifteen prisoners who new what their ultimate fate was likely to be, and who escaped, the concentration camp inmates who had carried out this work were executed by the SS." Clearly - the pictures you post could be from anywhere at anytime - the only source backing up these pictures is a highly biased and compromised political movement seeking to justify their own agenda. Whereas the source above can be corroborated by any one of several thousands documents, and by several hundred highly regarded historian and writers all over the world. I failt to see why any intelligent person would dismiss the work of people like Arendt out of hand, while apparently swallowing wholesale anything sourced from a handful of highly politicised sources, who have already been discredited by every significant educational facility on earth. Hannover, could you explain a little bit more about the alledged "documentation"? Who wrote it, when was it found, where is it? There is absolutely no way all the evidence for such a mass murder could have been destroyed. Even the alleged evidence destruction operation would have left a great deal of evidence. It could be detected by archaeologist today. Has there been an effort to scientifically investigate this site in recent years (or ever)? The original 'documentation' is missing; never existed is more like it. As previously stated, the Einsatzgruppen Reports which make the claims of 31,000 - 34,000 are nowhere to be found. We curiously only have 'copies'. Ofcourse, that is the case with so many 'holocau$t' documents'. The photos are from the US National Archives, they authenticated them. You post text that is debunked by Revisionist scholars. That text cannot be confirmed by physical/forensic evidence. Arendt is therefore barking in the wind, she does profit mightily from her nonsense, however. You, in fact, have failed to refute the points made in this thread, why can't you? Your citing of text which has no legitimate foundation is simply called 'garbage in, garbage out'. Bogus starting data leads to erroneous conclusions. I also see you support communist Soviet tales of 100,000 at Babi Yar. So which story do you want to go with ... 100,000, or 34,000? So where's the remains of your 100,000? Is it that only Jews' corpses vanish, while mummies & the Czar's family can be found? Soda appears to base his opinions enitrely on how frequently a story is repeated by orthodox historians, who are all basing their opinions on an unquestioning faith in the scant original 'evidence'. He seems to believe that this repetition and continuing acceptence somehow strengthen the original sources. Soda, set aside for a moment your pack-animal instincts and take a look at the evidence that revisionist and orthodox historians are basing their opinions on. Look at what the orthodox historians say and then look at what the revisionists say and make up your own mind without considering how many people with degrees are going to be standing next to you after you make your choice. You would need the original negative and a stereoscope to evaluate this aerial photo. The image shown on a computer screen does not have sufficient resolution. Bergmann wrote: You would need the original negative and a stereoscope to evaluate this aerial photo. The image shown on a computer screen does not have sufficient resolution. so we can not say the foto refutes babi jar massacer? Germania wrote: so we can not say the foto refutes babi jar massacer? To be quite frank, to me the resolution of this picture is so low that I myself cannot form a good opinion. (Same on similar pictures of the Treblinka and Belzec areas.) I would need the opinion of someone who is experienced in reading this sort of photo, like a geologist or surveyor. Max,with all due respect and no insult intended,you seem to be rambling.You talk about murder"s documentation as evidence,but haven't produced any.Then you go on with desperate sounding "what if's"like germans destroying evidence or a different location.Provide your proof please,sir. I have a problem with these so called Einsatzgruppen Reports: Who prepared them and how accurate are they? And why is the report for the day when the alleged massacre occurred, missing? oberststuhlherr wrote: There is absolutely no way all the evidence for such a mass murder could have been destroyed. Even the alleged evidence destruction operation would have left a great deal of evidence. It could be detected by archaeologist today. Has there been an effort to scientifically investigate this site in recent years (or ever)? Perhaps this has been addressed, and I missed it. IIRC Graf http://vho.org/GB/Books/Giant/ suggested there never was an effort made to look for forensic evidence. Is this correct? oberststuhlherr wrote: Perhaps this has been addressed, and I missed it. IIRC Graf http://vho.org/GB/Books/Giant/ suggested there never was an effort made to look for forensic evidence. Is this correct? As far as I know, the Soviets did some excavations in Babi Jar right after the area was liberated by them. Result: They did not find anything. Presumably it was at that time when it was decided to float the myth that SS-man Bloebel desinterred the bodies, cremated them and made the mass graves disappear. I believe that the Soviets also increaed the number of the victims to 100,000. And it is possible that some German post war kangaroo courts increased the number even further. 33.771 Victims -> 50.000 shots fired? Each casing has a batch number imprinted. Standard ballistic crime scene work.